Baseballisms merchandise is now available! Click on any product to see the item up close and personal. Change colors, styles and even see it modeled for you! 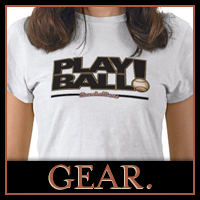 Many of the t-shirt products that you see are branded with the Baseballisms logo on the back. I got this shirt this year and I make sure to wear it to as many baseball games as I can or out on the weekend so people know I'm a true baseball scholar.